This easy slow cooker chowder is packed with vegetables, leftover Thanksgiving turkey and a creamy potato base. A perfect hearty and comforting dinner! To the bowl of a 5-6 quart slow cooker, add turkey, chopped carrots and onions, along with peas, green beans and corn. Chop potatoes into 1/2-inch pieces, add to slow cooker. Sprinkle with seasonings. Microwave mashed potatoes for 45 seconds to soften. Add to a blender along with chicken broth. Process until smooth. Pour into slow cooker. Stir to combine. Cook on high 4 hours or low 6-8. For a thicker consistency: combine flour and creamy until smooth, stir in during last 30 minutes. Continue cooking with lid on. For a less thick consistency: omit flour, stir in heavy cream and continue cooking for the remaining 30 minutes. Meanwhile, preheat oven to 350°F. Toast stuffing for 15-20 minutes or until crisp. 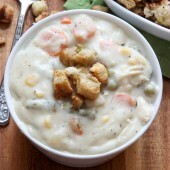 Serve chowder warm with optional stuffing croutons. Recipe yields roughly 8: 1 1/2 cup servings. *Gluten free option: substitute 2Tb cornstarch for flour. Use gluten free stuffing.